Crepes and chocolate are a happy combination. There are hundreds of recipes for a basic crepe and probably about as many ways to fill them with chocolate. This one for the crepe comes from a 1960 cookbook, Menus for Entertaining, by Juliette Elkon and Elaine Ross. Together these ladies ran a food consulting business and were frequent contributors to Gourmet Magazine. The black and white photo on the jacket shows them seated together smiling over the flowered china and silver at afternoon tea–hair carefully coiffed in the style of the day, necklines elegantly low-cut. “First of all housewives, mothers and good hostesses”, they say about themselves. To that I’d add: originators of a crepe recipe that is hands down the “Best of Show”. It’s uncomplicated, the batter can be made hours in advance, and so can the crepes (even a day ahead) and reheated before filling. 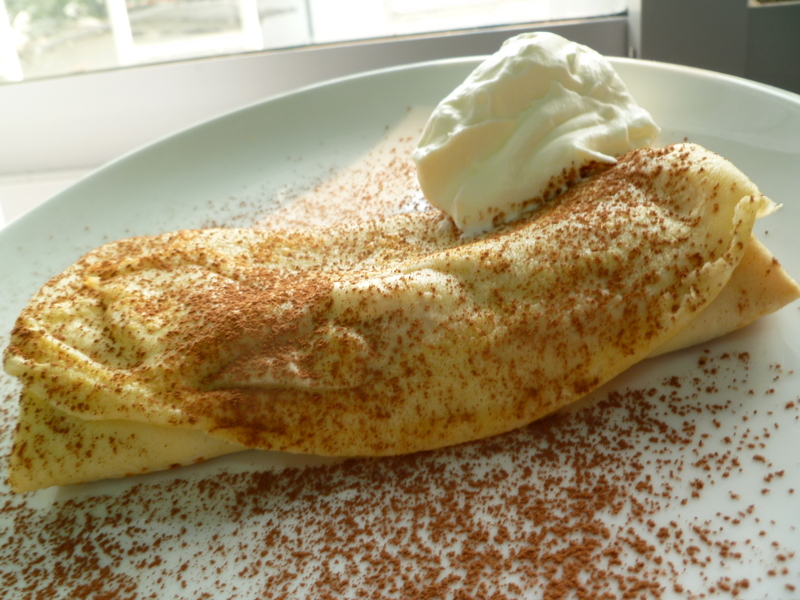 Without any adjustments to the batter, this crepe works well for savoury fillings, too. Make the batter at least 2 hours before frying crepes, and let it stand at room temperature. Beat the eggs, add the flour and salt and beat again. Gradually pour in the milk. Add the melted butter and cognac and beat until batter is smooth. To make the crepes: The amount of batter you use will depend upon the size of your pan. (I use a 9-inch crepe pan and about 1/4 cup batter per crepe, but any small-ish flat-bottomed pan with sloping sides will work.) Grease the pan by wiping it with a paper towel moistened with a little vegetable oil. Heat the pan very hot but not smoking. Pour on the batter and tilt the pan around to spread the batter and form the crepe. Fry until golden on bottom and dry on the top. (This will take only a couple of minutes.) Flip the crepe and shake the pan from side to side so that the second side browns a little. Transfer the crepe to a plate, cover it loosely with a napkin, and repeat. In a medium sized saucepan, whisk together the sugar and flour. Gradually add the milk, whisking to combine. Add the egg. Add the chocolate and butter and cook over medium heat, stirring, until the mixture is smooth and thickened and comes slowly to a sluggish boil. Remove the pot of chocolate from the heat and add the vanilla. (The filling can be made a day ahead and refrigerated. Reheat before assembling the crepes. 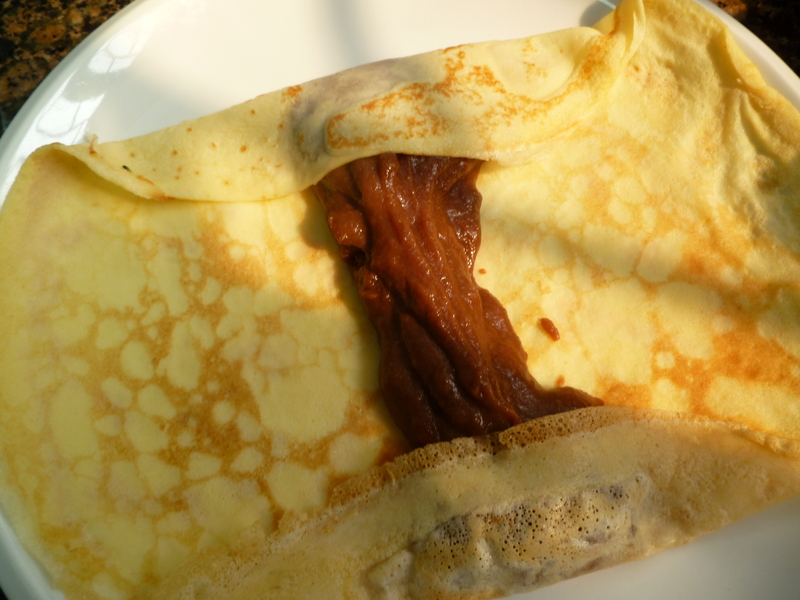 To fill the crepes: Place a crepe on a plate. Put a couple of heaping Tablespoons of filling down the center of the crepe. Fold the top and bottom sides inward to cover the ends of the filling. 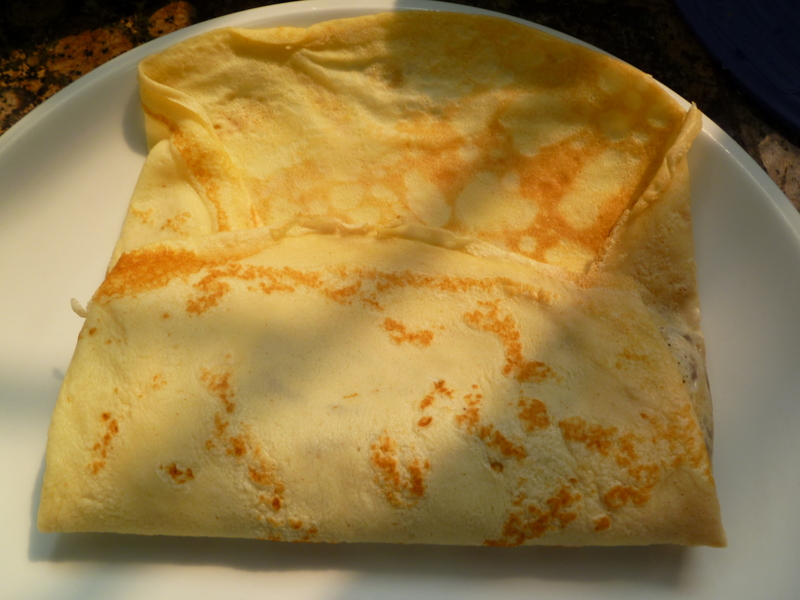 Fold the left side of the crepe in, over the filling. Roll the crepe over onto the right side of the crepe. The folded edges are now facing down, on the plate. Transfer the crepe to a dessert plate. 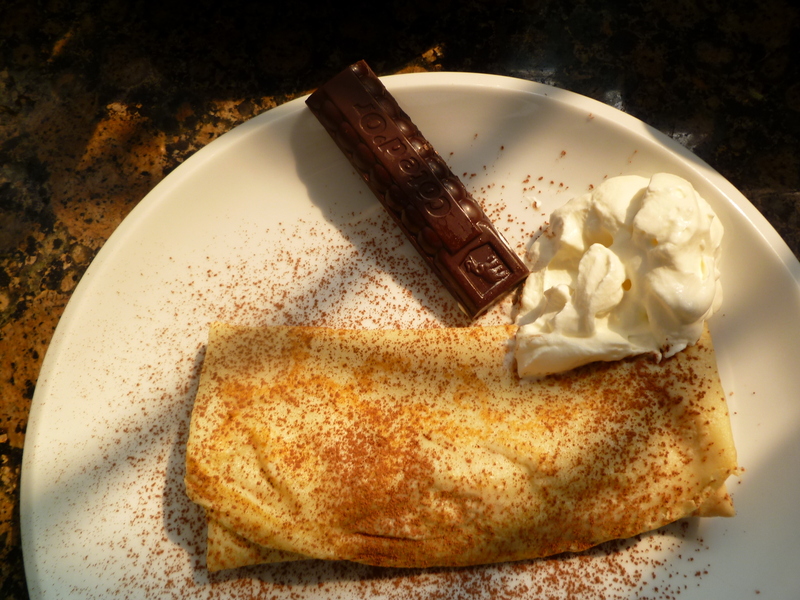 Suggestions for serving: Sift unsweetened cocoa powder through a small strainer onto the crepe and around on the plate. A large dollop of sweetened whipped cream at the side is also nice. Now this is something of which I approve.